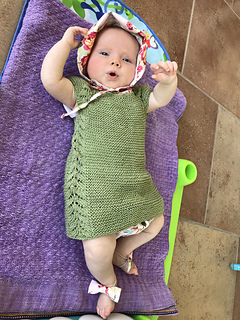 This seamless little top down dress / tunic top is an easy knit, worked in garter stitch with a simple leaf pattern forming the front borders, then cascading down the sides. 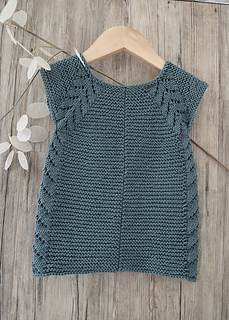 I would rate this pattern suitable for the intermediate knitter. 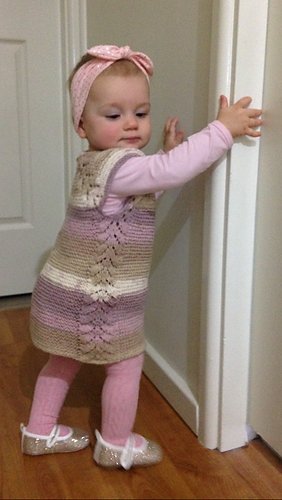 The pattern comes with schematics, and row by row instructions. Best of all…. No seaming !!. 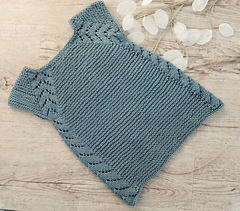 This is an addition to my Norwegian Fir Top down cardigan. MATERIALS REQUIRED -- Light #3, Double Knit, Light Worsted yarn, 120m /137 yards per 50 gram ball. Second size (Size B) should read P6, INSTEAD OF P8. K4, yo, K1, K4, P2 tog, INSTEAD of K4, yo, K5, K4….. 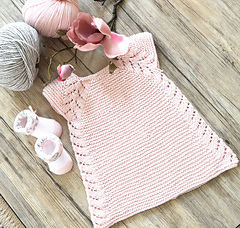 Anyone who has purchased this pattern after 30/09/2017 will receive the updated version.